Do you want to be a Building Hero? Apply today! 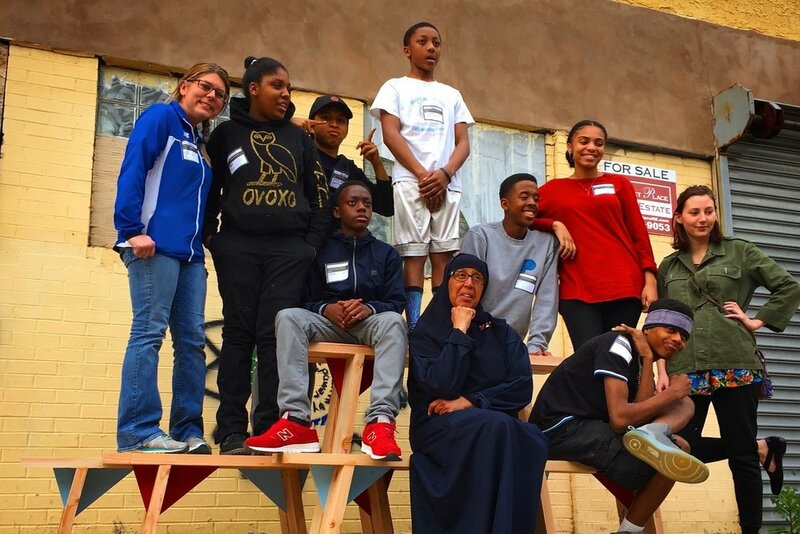 The Building Hero Project is a community design leadership initiative for youth and adults to become skilled leaders and change agents, empowering them to help make their neighborhoods and Philadelphia better place to live through design. Through innovative training in design, collaboration, leadership, fabrication, and entrepreneurship, the Building Heroes gain the life skills, experience, inter-connectedness, and exposure to rich opportunities that enable them to make and do great things in Philadelphia and beyond. Tiny WPA received a Play Everywhere Challenge Grant from KaBOOM! in 2017 to create and install playable benches and bike racks along Lancaster Avenue. 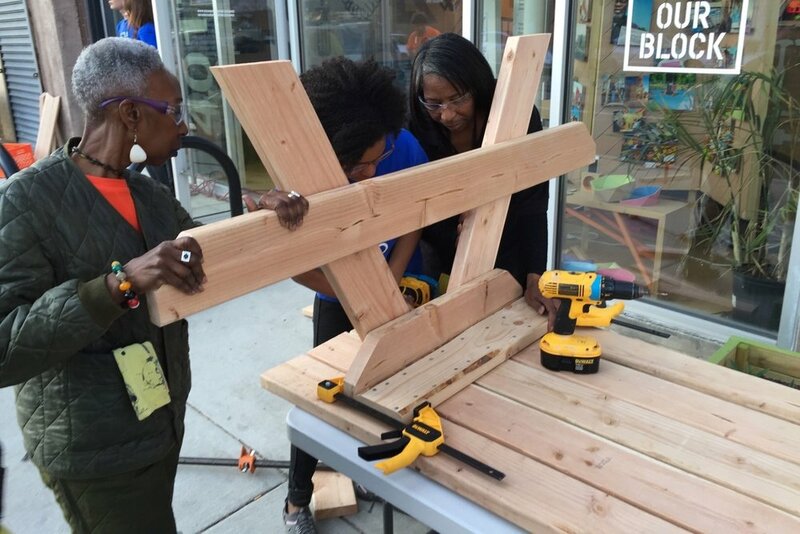 On Wednesdays from 4 - 7pm, we host our free weekly Stop By + Build program. During Stop By + Build, everyone is welcome to drop in to get help with a project or an idea; learn how to use a tool while helping build something great with others; check out the workshop and learn about our numerous community-led improvement projects; and meet other people who want to build things that make a difference. If you are interested in hiring Tiny WPA and our Building Heroes for custom contract fabrication work, contact us! It's a great way to support an apprenticeship/learning experience for a young person and get something rad too. Engaging people of all ages in the design of the cities. Projects are developed in response to communities' specific challenge(s). Each project is built by the community for the community. "It would be great if we could build more useful and creative things around our city to make it a better and happier place." Philadelphia has 40,000 vacant lots, 20,000 under-loved bus stops, as well as crumbling parks, playgrounds and schools. Throughout the city there are also scores of young adults who need jobs, seek more hands-on experience to make school and learning more meaningful, and deeply want to make their communities better places to live. We believe that incredible things can happen when we connect youth with the needs of our city and empower them to design and build innovative solutions to address these challenges. To this end we created Tiny WPA. Originally conceived as a program of Public Workshop, Tiny WPA has since expanded in response to the overwhelming enthusiasm of teens, the growing interests in creative place-based change, and the need to connect and grow a field of community design leaders. Today, Tiny WPA is a nonprofit organization that places youth and adults at the forefront of stimulating community engagement and civic innovation in Philadelphia by empowering them to design and build improvements to the public spaces, schools and micro-infrastructure in their neighborhoods.